On Monday 10 October 2016, the West End production of Andrew Lloyd Webber’s THE PHANTOM OF THE OPERA will celebrate its 30th Anniversary with a special gala performance in aid of The Music in Secondary Schools Trust. With tickets for the special performance now on sale, priced between £19.86, £30.00 and £300 (for top price seats and an invitation to the private after-show party), the performance will feature the current company along with the original cast and special guests. 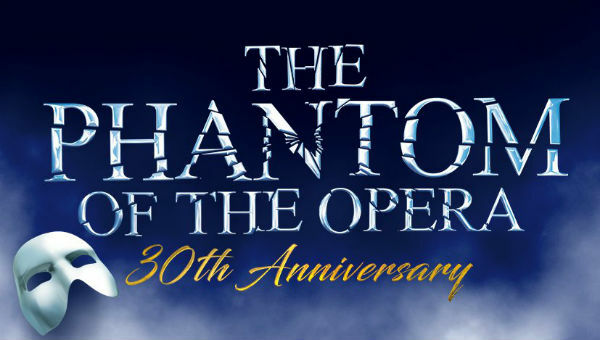 Produced by Cameron Mackintosh, THE PHANTOM OF THE OPERA originally opened at Her Majesty’s Theatre on the 9th October in 1986, starring Michael Crawford as ‘The Phantom’ and Sarah Brightman as ‘Christine’. Since then it has gone on to win 50 theatre awards including three Olivier Awards in the West End and seven Tonys on Broadway. It was the winner of the Olivier Audience Award, voted by the public, in the 2016 Laurence Olivier Awards. In October 2010, the musical celebrated its 25th anniversary with a staging taking place at the Royal Albert Hall, which was also broadcast to cinemas around the world by Universal Pictures and in October 2016 will have played 12,500 performances in London. The current cast of THE PHANTOM OF THE OPERA includes Ben Forster as ‘The Phantom’, Celinde Schoenmaker as ‘Christine Daae’ and Nadim Naaman as ‘Raoul’.